One could say Bill was born to be a Sheriff’s deputy. With a name like Shellhammer, how could he not have been predestined to live a life laying down the law? Purcellville resident William “Bill” P. Shellhammer died in his home December 16, aged 80. He was a retired Loudoun County Sheriff’s deputy, a former Vienna Police Department deputy and a U.S. Marine Corps veteran who served during the Korean War. These days, if a Sheriff’s Deputy knows you by name it indicates that you are a delinquent or a malefactor who is up to no good. In Shellhammer’s heyday, however, it was a mark of his sharpness of mind. Shellhammer knew every kid by name in 1960s Vienna. If you misbehaved or were up to no good, you had better prepare yourself for a stern talking to. Bill took on the proxy role as a parent in uniform; he meant business if he called you by your surname instead of your first name. ‘What would your mother think?’ He would ask, sending quivers down spines. You couldn’t bank on his forgetfulness, either. He was known to throw the book at recurring offenders. One Purcellville resident remembers Shellhammer dismissing his pleas for a warning for the offense of squealing wheels as a teen in Vienna. No such luck — Shellhammer remembered he had warned the teen six months prior. This time he would receive a ticket. He was tough but fair. Loudoun residents would joke that if he had found his own mother to be out of line he would write her out a ticket. This may be true, but often what is tough on the outside is soft on the inside. He treated everyone equally and had a good heart. He would often stay past his shift on special occasions so young kids could have their picture taken with him and his squad car. “Getting out of the car and meeting shop owners and citizens in the community was a large and important part of what Shellhammer did,” said former Loudoun County Sheriff Steve Simpson. Simpson consequently grew up in Vienna, and one of his first encounters with Shellhammer further cemented Simpson’s goal to become a police officer when aged 10 or 11 he attended a firearms safety program at which Shellhammer was an instructor and member of the Vienna Police Pistol Team, who were national champions. “The final day of the program he and several members of the team demonstrated some of their shooting abilities. He put an ax in the middle hung from a T frame with pigeons on either side. His hand gun shot the ax blade which would split the bullet in half and would break the clay pigeon on each side. I even still have one of the bullets from that day,” said Sheriff Simpson. 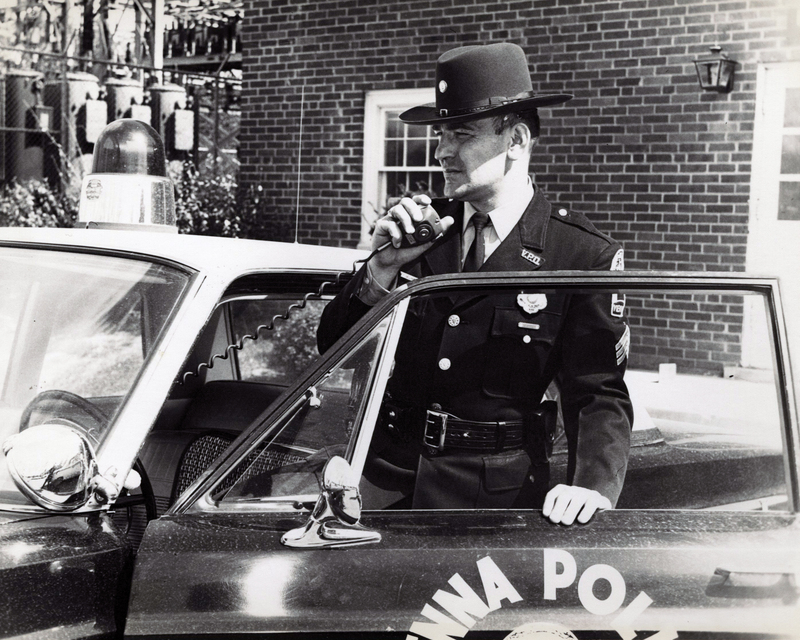 During his time as an officer, just about every western Loudoun resident was handed a ticket from him. Even the Vienna residents who couldn’t escape the “Hammer’s” tickets as teens would find that years later they would be pounded again — this time most likely while he was patrolling along Route 9. Shellhammer was born August 31, 1934 in Apollo, Penn., to the late William Park Shellhammer Sr. and Genevieve Burkette. Bill joined the U.S. Marine Corps after graduating high school, serving five years during and in the Korean War. He then went on to work for the U.S. Secret Service as security detail for former U.S. Secretary of State Henry Kissinger and the Mellon family after joining the Vienna Police Department in Vienna, Va. He retired from the Loudoun County Sheriff Department. Bill is preceded in death by his daughter, Deborah Clark. He is survived by his son, Kurt Shellhammer (Debbie) of Stafford; grandchildren, Jeffrey, Gregory, Lindsey, Kevin and Nathan; and great-grandson, Bruce. The memorial service was held December 20 at Loudoun Funeral Chapel. Memorial donations may be made to the Loudoun County Sheriff’s Office, 803 Sycolin Road SE Leesburg, VA 20175 or to Loudoun County Deputy Sheriff’s Association, http://www.lcdsa.net/index.php.